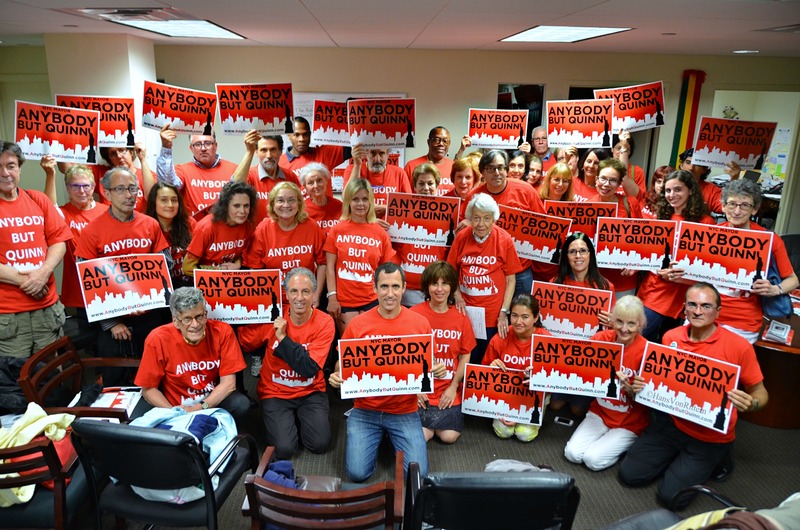 Photo of the day: ANYBODY BUT CHRISTINE QUINN! Photo of the day: ANYBODY BUT QUINN! – To my country wide and international readers, this may seem like a localized issue, but it is sadly not. I as a tour guide lost my job in 2011 at Gray Line tours, the double decker bus company soley because of councilwoman and mayoral candidate Christine Quinn. How it came to be: two men complained that the tour guides could be heard on Greenwich Avenue in the Greenwich Village section of Manhattan. It is a main commercial thoroughfare with the now gone St. Vincent’s hospital across the street with their blaring sirens going all night. Bars line the street that play European soccer matches till 4am in the morning. A grade school play ground is across the street, all that noise, but we were too much. A “headset bill’ was instituted by Christine Quinn with a sound test to be done, it was never ever done. Councilwoman Gail Brewer insisted to insure the tour guides jobs, a proviso be included in the bill that the headsets be connected to a live guide, that was done. But — Twin America is the monopoly that owns both the double decker bus companies (the blue City Sights and the red Gray Line) wanted the ‘live guide’ proviso taken out. Why pay for my health insurance and salaries when you can have a recording do it for free? In the middle of the night Quinn took out the live guide proviso saying “it isn’t necessary.” You see, Twin America has always contributed heavily to her political campaign. The guides protested at all the local TV stations with our slogan “Keep New York Live.” My dear friend and anti-Quinn champion Donny Moss joined in. At our last gasp rally to be held at noon on the steps of City Hall, no press showed up. When I called a local TV reporter friend of mine asking where the press was, I was told Quinn had told everyone the rally was canceled. The bill passed. Oddly enough, any guide that had been seen protesting try to save their jobs were not fired but simply not ‘allowed’ to come to work anymore – I was one of them. Councilwoman Christine Quinn wants to be mayor of this city. She is the puppet of Mayor Bloomberg. During their time in office, New York City has lost many hundreds of long time established restaurants, shops, bars, schools, hospitals, parks, and memorials for the sake of greedy real estate greed to build “luxury” apartment buildings than that of any other political team in the city’s history. We tour guides get almost daily notices of yet another hospital, restaurant or long time establishment closing due to doubling rent – yes double. Doubling rent on businesses has become the norm, leaving only the chain stores to survive. Zoning variance – the norm, Quinn rubber stamps them, the money goes in her pocket. The hospital I was born in is gone. Also St. Vincent’s hospital that took in the only survivors of The Titanic was at the epicenter of the AIDS crisis, was first in line to respond to the 911 victims has been torn down by Quinn. But – that was not enough, St. Vincent’s church was torn down as well and the 911 Tiles For America Memorial across the street has been torn down too, to assure no memory is left of the site. If she becomes mayor, there will no “New York” left for you to see. Quinn/Berg plan to completely surround Grand Central Station with bulging sky scrappers. The Chyrsler Building will be hardly seen anymore! None of these building plans take into consideration that our electrical grid is already stretched to the max. Instead of protecting our shores from the rising sea level and future hurricanes, Bloomberg and Quinn build, build, build more glass boxes for instant profit, chain stores take over and screw the future. She herself changes the laws to fit her monetary gain. This is how dictatorships start. QUINN IS GAY FOR PAY! Touting herself as the breaktrough first gay mayor of NYC – she has not voted for ONE pro-gay bill or legislation, not one. But on gay pride day – she runs to the front of the parade waving her arms in the air. GAY FOR PAY! I have joined Donny Moss and the ‘Defeat Christine Quinn’ and ‘ABQ’ campaign. HELP SAVE NEW YORK. I will vote for New York, I will vote against corrupt Christine Quinn! I am fighting hard for the ANYBODY BUT QUINN campaign. If you are a New Yorker, please read on to inform yourself of her devious record. . . The Speaker position concentrates an extraordinary amount of power in the hands on one person. As Speaker for the past five years, Quinn has abused that power to advance her political career at the expense of the democratic process and the public she alleges to serve. Example: In March, Quinn strong-armed Council members to vote to rename the Queensboro Bridge in honor of former Mayor Ed Koch. Months later, in December, Koch endorsed Quinn for Mayor—two years before the election. A poll found that a majority of voters (64 percent) opposed renaming the bridge after Koch, and Council member Peter Vallone Jr., of Astoria, spoke out against it. Quinn responded by cutting Vallone’s discretionary funds by $600,000. To put this political stunt in historical context, the Triboro Bridge wasn’t renamed after Robert F. Kennedy until 40 years after his assassination. After the 2008 slush fund fiasco destroyed her chances of becoming Mayor in 2009, Quinn needed four more years to improve her image. But her role in overturning term limits has only further damaged her reputation. As Kate Taylor reported in the January 5 New York Times, Quinn has already raised more than $4.9 million in campaign contributions. The vast majority of donors who have made the maximum legal contribution of $4,950 to Quinn’s campaign are real estate executives, as are many of the campaign bundlers who have raised more than $20,000. In return, Quinn advocates tirelessly for real estate developers at the expense of her constituents. As WestView readers know, Bill Rudin is planning to build 450 luxury condos on the site of St. Vincent’s Hospital, in Quinn’s district. True to form, Quinn has publicly stated on several occasions that the Lower West Side needs a full service hospital while helping pave the way for Rudin to erect his condos. As of July 2011, seven members of the Rudin family had contributed a total of more than $30,000 to Quinn’s campaign, which may help explain why Quinn not only refused to advocate for tapping into millions of dollars in available reserve funds that might have helped save St. Vincent’s, but also refused to support a community effort to keep the St. Vincent’s site zoned for community use. Not only has Quinn killed every substantive animal protection bill introduced into the Council, but she has also fast-tracked several meaningless bills that make her look like she’s helping animals when, in reality, she’s only helping herself politically. Example: A majority of New Yorkers support a ban on horse-drawn carriages. Quinn does not, and she has killed legislative efforts to take the carriage horses off the streets. But in an effort to make herself look as though she cares about the welfare of the horses, Quinn fast-tracked a bill in 2010 that was filled with fake reforms such as banning carriages operators from working below 34th Street, where they don’t work anyway, or between the hours of 3:00 and 7:00 a.m., when no customers are out. The purpose of the bill was to grant carriage operators a rate hike, but Quinn only touted the fake reforms in the press, giving the impression that she’s an advocate for animals when she has been just the opposite. In 2011, at least seven carriage horses collapsed, tripped, spooked and died in midtown. In January 2011, Quinn fast-tracked another bill that makes it illegal for New Yorkers to chain their dogs outside for more than three hours. Quinn admitted that the bill is unenforceable, but she held a press conference promoting this meaningless bill, again giving New Yorkers the impression that she cares about animal welfare. In September 2011, Quinn fast-tracked another bill that erased a law requiring a city-funded animal shelter in every borough. She did this as a favor to Bloomberg so the City could dodge a lawsuit demanding that it fulfill this obligation. (Shelters are desperately needed in The Bronx and Queens.) Rather than being honest about the purpose of the bill, Quinn added language to it mandating increased resources for existing shelters, thereby making a step backward for animals look like a step forward. 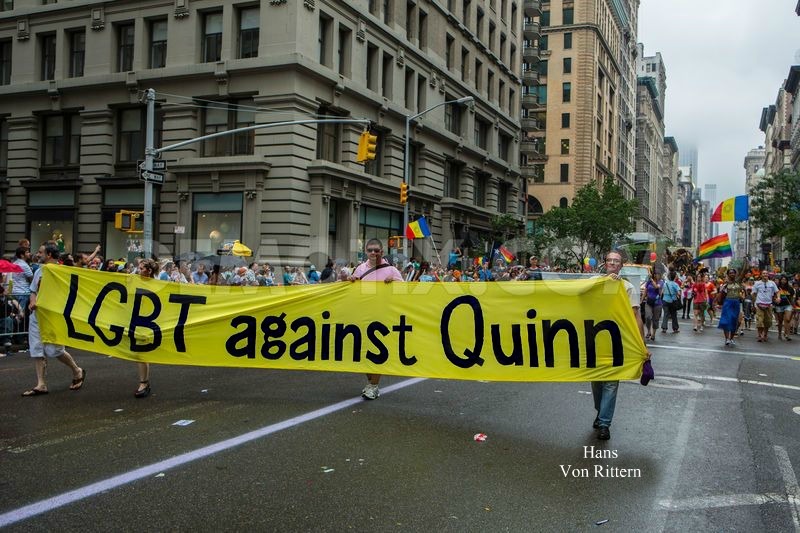 How much of Quinn’s campaign is being funded by NYC taxpayers? In the last election, it was a fair amount. In an article in the August 20, 2009 Village Voice, Elizabeth Dwoskin reported that 31 of Quinn’s “more than 90 volunteers” were in fact paid staffers, though Quinn’s spokesperson claimed they were doing the work on their own time. Quinn has a vast amount of taxpayer-funded city resources at her disposal for her campaign, including a chauffeured SUV. She has the support of Mayor Bloomberg, his paid consultant Ed Koch, the Democratic Establishment and the LGBT community. She has a bully pulpit as Speaker and has the Mayor inviting her to speak at high profile events. But perhaps that’s not a bad thing, because the more potential supporters are exposed to her, the more chances they have to see how much there is about her candidacy not to like. On our side, we have the truth about Quinn’s record; a public that is becoming more informed about her; several other viable candidates for Mayor; and the will to fight to restore ethics, fairness, democracy and humanity to NYC government. My 87 year old mother canvases our local street handing out fliers to anyone that will listen – so do I.
I lost my Gray Line tour guide job of seven years because of her bullying through a ‘headset bill‘ in New York City. It all started two years ago when two older residents on Greenwich Avenue complained about guides on open mic and insist we be rerouted. We tried all diff routes, but Greenwich is largest, best flow and connection to the rest of the routes and bus stops. These complainers had the sirens of St. Vincent’s Hospital, a school yard with screaming grade school kids and the bars showing European soccer matches to boisterous patrons till 4am – if u do not like the noise – move to a better location, you knew what u where getting into when u moved in. So a headset law was suggested. No one seemed to hear ’noise’ but them. Guards were placed at the corner to see if we were off mic. A noise “study” was supposed to have been done and magically was never needed. NYC councilwoman Gail Brewer tried to help us and insisted a proviso be put in the bill the headsets be connected to a live guide. ALL tour guides rallied, spoke on TV and radio and press to “Keep New York Live”. Greg Mocker/WPIX11 befriended me and joined our cause. Rumor was that Twin America, the monopoly that owns blue City Sights and red Gray Line double decker buses was trying to get the ’live guide’ proviso thrown out. No tour guides = no high licensed salaries, no health insurance. BINGO! The proviso was erased in the middle of the night by Quinn, because Quinn is in the pocket of Twin America and they padded her coffers for her mayoral run. She simply claimed the proviso was ‘not needed’. We held one big last ditch effort rally on the steps of city hall at noon time. 12:30….no press, no one. I called TV transit reporter Greg Mocker “Where are you?! !” ‘It’s canceled, isn’t it?’ Quinn had called the press and told them it was canceled. The bill passed with live tour guides eliminated. Councilwoman Brewer cowered under Quinn and was a bit of a wimp, she needed funding for her district. Next came the slaughter of the guides. We had a sign up book, you would sign the days you wanted to work for the next few weeks. Allllll of a sudden, any guide who was seen at NBC, ABC, WPIX11, CBS News, etc was not ‘allowed’ to sign up with no reason given. I was one of their top tour guides. I never had one complaint. I was requested world wide, did all their celebrity tours (Liza Minnelli, Heidi Klum, Cyndi Lauper, etc.) yet I was no longer allowed to sign the book. A fellow tour guide overheard my boss Eva Lee tell the dispatcher “these people are effectively no longer here.” With pressure mounting by the guides, Gray Line said we could re-apply for our jobs, but not at $17.75 an hour with insurance, but with $12.75 and hour, no insurance. We applied. “If a position arises we will contact you” we were told with the iciest of cold faces. Meanwhile through the tour guide grape vine we heard they were begging and pleading other less experienced guides to please come in. Senior guides were offered insulting low buyouts. Gray Line wanted no one left with a memory of what it used to be like. Guides who had worked there 18 years! !, spoke 5 languages!, were now gone. They wanted no one to question the ‘new authority.’ No rebels, just quiet frightened to death zombie guides. Then they realized no one was watching the tourists on top, so they hired illiterate ‘watchers’ to sit on top and make sure guests didn’t stand up. Pay was about $7-11 per hour. The recorded tour tapes didn’t and don’t work well (at first they didn’t at all!) so now they are hiring guides who are given the answers to the Tour Guides License test, so any idiot can pass the test. Watch them, the buses pass by and the guide is saying nothing, or babbling utter incoherent nonsense. And so here we are. 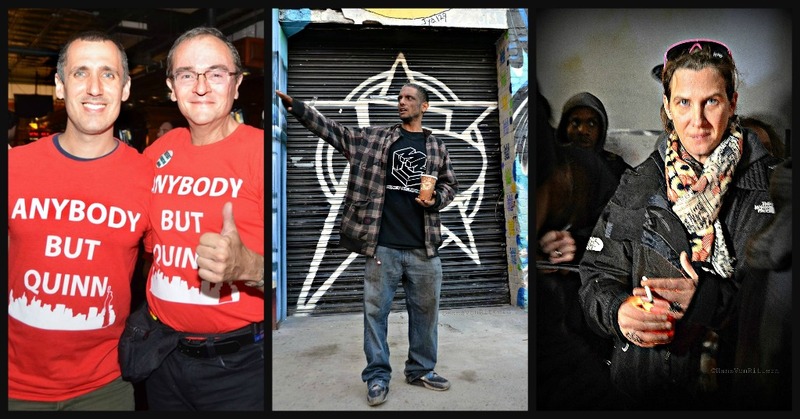 New York tourists are greeted by these “ambassadors to the city” – it’s a joke. The headset law was bullied thru by Quinn, the required noise study was NEVER done and hundreds of guides my age (57 and older) don’t find it easy at all to find work in this city at our age or at other companies. It is almost impossible. You have to be minimally bilingual (I am/German) or be the darling of one of the smaller companies. Smaller companies don’t have the work, salaries and clients. So many guides went bankrupt, moved, sold their things, took several other low paying jobs = slaughtered by that greedy dictator! There are many other reasons I will cut my hand off before I vote for Christine Quinn. Zoning variances have become the norm in New York and we are becoming a city of soul-less glass boxes since she is in the deep pockets of the real estate Rudin family. Councilmembers are afraid of her. Vote against her – your funding is cut. She over turned term limits in the middle of the night as well so that elitist mayor Bloomberg could buy a third term. NYC had voted TWICE for a two term limit. How is this a free country?